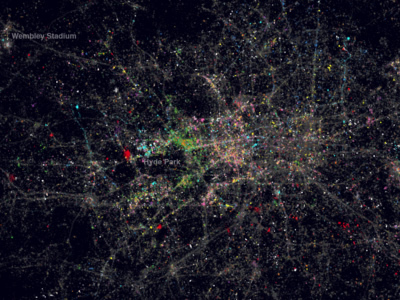 Using an algorithm adapted from web browser Google Chrome, engineering doctorate candidate Ed Manley and spatial analysis lecturer James Cheshire, both from University College London, were able to detect the language of tweets sent from the London area over the summer. 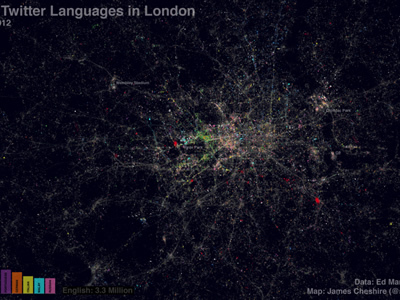 Of 3.3 million tweets, 92.5 per cent are, not surprisingly, in English. The biggest tweeting tongues after that are Spanish (grey), French (red), Turkish (dark blue), Arabic (green), Portuguese (purple), German (orange), Italian (yellow), Malay (turquoise) and Russian (pink). Arabic tweeters are busy in the strongly Middle Eastern area of Edgware Road, to the north-east of Hyde Park. They are also thick on the ground in the top-drawer shopping districts of Knightsbridge and Kensington. Turkish tweeting is spread across north London, while there are clear hotspots of Francophone activity - one in fashionable Notting Hill and another at the Institut Français.